Use the grill to boost the flavor of fresh summer vegetables. Preheat a grill or grill pan on medium-high. In a small bowl, combine lemon juice, 2 tablespoons olive oil, 1/4 teaspoon salt and 1/4 teaspoon pepper. Slice avocados in half and remove pits, leaving the skin intact. Brush lemon juice mixture onto the flesh and skin side of each avocado to prevent sticking on the grill. In a small bowl, toss tomatoes, bell peppers and onions with 1/4 teaspoon salt, 1/4 teaspoon pepper and remaining 2 tablespoons olive oil. Grill avocados flesh side down, 1-2 minutes until dark grill marks form. Flip and continue cooking for 1-2 minutes more. Grill remaining vegetables for 3-4 minutes on each side or until charred and tender. Place avocado halves on a serving plate. Transfer remaining vegetables to a food processor. Add crushed red pepper. Pulse gently to form a chunky relish. 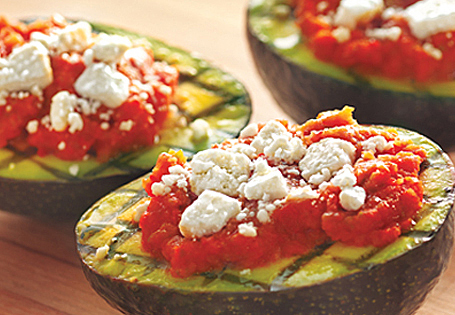 Top each avocado half with the vegetable relish and sprinkle with feta cheese. Drizzle with remaining lemon juice mixture.